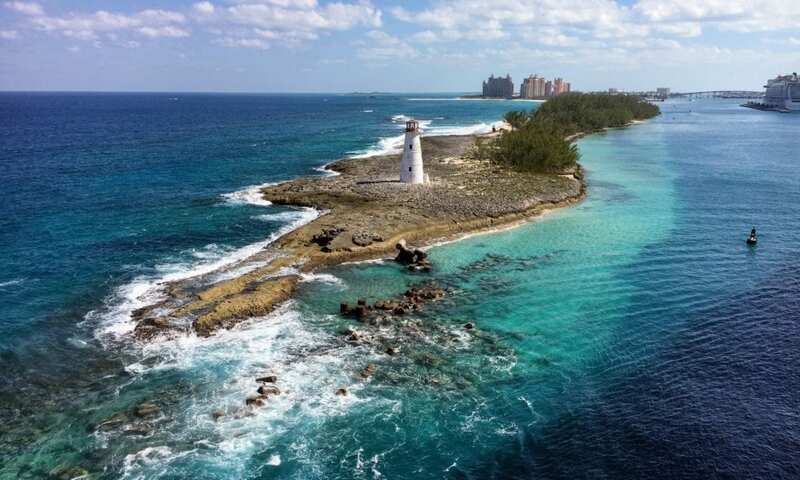 If you are taking a family cruise out of pretty much any port on the east coast of Florida, chances are it will make a stop in Nassau: the capital city of the Bahamas. In fact, 3.5 million cruise guests stop in Nassau, Bahamas annually. Interesting fact: The Bahamas are made up of over 700 islands. While this port has lost some of its luster over the years, they are actively trying to rectify that situation. Recently, downtown Nassau announced a $250 million port makeover. Despite its criticism, Nassau is still a fascinating place, with a lot to share — IF you know where to look. After all, there is much more to do in Nassau than going to the straw market, walking up and down Bay Street, or just staying on the cruise ship. Atlantis is a really unique resort. It combines a beach, 141-acre aqua park, casino, an aquarium, and not to mention a stunning main building. A taxi ($5 per person) or water shuttle ($8 round-trip) is certainly the easiest, though the ship will also offer shore excursions. The taxi drivers are friendly and the United States dollar is on par with the Bahamian dollar, so you don’t have to worry about currency conversions. To walk around Atlantis is free, to play will cost you. Atlantis is not cheap by any measure. The least expensive option is $39.38 which includes a “self-guided tour through the tunnels of Atlantis,“ otherwise known as the aquarium. This does not include the beach or the water park. The second option adds the beach and is $65.72. The third choice is probably the most popular as it includes the above, plus the Aquaventure Water Park. A day pass is $157 for guests 13 and over, and $103 for 12 and under. Frankly, if you come with kids, I’m not sure how you could buy less than this one — once they see those water slides, it’ll already be decided. The Aquapark is really great fun for all ages, with multiple slides, a river, and everything else you would expect. The beach is nice, though a little small, and the aquarium is fun but also lacks in size. The resort itself is really beautiful; however, aside from the casino or restaurants, there is not much to do if you are not going to purchase one of the day-passes as described above. For me, I personally think that the costs are just too high for most families. This is especially true if your cruise also stops in one of the private islands, such as CocoCay, which have been massively improved over the years and include many of the same attractions as Atlantis at a lower cost. Balmoral island is a popular beach destination in Nassau. For many families, a Caribbean cruise is synonymous with a beach vacation, and Nassau definitely has that covered! Paradise Island has Atlantis, as previously described, but there are other ample choices which all offer white sands, clear water, and a guaranteed great day by the ocean. If your family is looking for a relaxing beach package, the cruise ship can offer a few options, but you can also book them independently. Balmoral Island is one of these, which is about a 30-minute ferry ride from the cruise port. The entire tour is about 4 ½ hours, so plenty of time to get there, enjoy the beach, and return to the ship without worry. There are two basic options which both include the ferry ride to Atlantis Paradise Island, loungers and umbrellas, use of noodles and pool toys, two swimming pools, and access to the kids play area. For adults, the price is $79.99 and kids are $59.99 for a lunch-and-drink-included tour, or $49.99 & $29.99 for the a la carte option. Blue Lagoon is another choice with similar amenities at $69 and $45- including lunch; however, drinks are additional. Typically, Blue Lagoon island must be booked through your cruise line, but call or email to check the status of that. Both Blue Lagoon and Balmoral have optional animal encounters with dolphins and stingrays, but it should be mentioned that some guests complain the treatment of the animals is not up to US standards, while others reply that they seem happy and well taken care of. Cable Beach in Nassau is just far away from the 1000s of cruise guests. Additionally, some of the all-inclusive resorts offer day-pass options. Currently, family-friendly resorts include the Melia at Cable Beach and British Colonial Hilton, both offering day-passes. The Hilton will cost $100 for adults, which includes a $40 resort food & drink credit, and $40 for kids with a $20 credit. At the Melia, prices are a bit higher, at $140 for adults & $60 for the kids, but the amenities are better than the Hilton — with more pools, larger white sand beaches, and additional food choices. The Melia resort will require a taxi ride, costing around $15. However, the Hilton is walkable, at about 10-15 minutes from the cruise terminal or a short five-minute taxi ride. A side note, Baha Mar resort is right next to the Melia. That is the resort that was started in 2011 and kept running into financial issues, finally opening one of the resorts in 2017. Nassau is a surprisingly interesting city, from a historical perspective — bringing guests the beauty of it’s 18th-century colonial architecture. As the capital of the Commonwealth of the Bahamas, the city has been the seat of government for over 300 years, and has many important sights relating to this history. As a constitutional monarchy with Her Majesty Queen Elizabeth reigning as Queen of the Bahamas, the city also has some interesting royal connections. Two small forts watch over the town: Fort Charlotte, which is the larger of the two; and Fort Fincastle, which is accessed by the atmospheric, 66-step “Queens Staircase.” Parliament Square is very close to the cruise port and contains a statue of Queen Victoria, surrounded by pretty pink buildings. You could also walk by the government house. The downtown area also offers a few interesting museums, including the Pirate of Nassau Museum, National Art Gallery, Heritage Museum of the Bahamas, and several historic churches dating from the mid-1800s — Christ Church Anglican Cathedral is notable among these. It should be noted, however, that it is recommended to book a tour of the sights rather than try to see them on your own. The city, while statistically safe according to Caribbean standards for large cities, still is under a US State Department warning for crime, so it is best to use a reputable tour agency. There are many of these that can be found online with a simple search or, of course, you could book a tour directly through your cruise line. If underwater nature is something your family is interested in, then Nassau has some fun things to do right near the cruise port. When we were in port, we decided to try a snorkel boat tour right from the docks. Our expectations were pretty low (as we figured the sea life in the area just couldn’t be that great because of the proximity to the town) but we were wrong! Now, please do not misunderstand me… this isn’t the Great Barrier Reef or anything like that. But, the coral was beautiful, we saw lots of fish and even a sea turtle in the turquoise waters, and had a really fun catamaran ride complete with rum punch for the adults. The entire trip was low key, fun, and a reasonable price. Costs range from around $50 for a three-hour tour to $89 for longer five-hour trips, and about half that for kids. There are a number of companies who can be booked ahead online or at the cruise pier when you arrive, which is what we did. And, of course, you could also book through your ship. If you choose to book on your own, confirm the times work with your cruise ships schedule. Nassau is an often-overlooked destination — hidden in plain sight, some might say. Because so many cruises stop there, many visitors choose to stay on-board simply because they have “done it before,” which is a real shame as the city has so much to offer. Take a chance with one of the ideas talked about above and I am confident that your family will have a memorable time. Harmony of the Seas docked in Nassau, Bahamas. 1. Eat on the Ship. If you plan on venturing over to the Atlantis resort, consider eating breakfast or lunch onboard the ship. A hamburger at the sports bar will run you $15. 2. Pay attention to the time. Nassau has a very long pier, so make sure your watch and clocks are set to ship time. The ship will not wait for you to return. 3. Take the Water Shuttle to Atlantis. This one rings even truer if there are a lot of ships in port. A lot of the taxis in Nassau are really vans, without air condition. At least if you’re on the water shuttle, you will have a steady fresh breeze. 4. The power of negotiation. If you venture over to the famous straw market, don’t pay the first price they tell you. It’s a big game, and most of the time the vendors are seeing what they can get out of you. If you walk away, nine times out of ten they will chase after you telling you they will accept your offer. 5. Don’t get your hair braided. Or if do, make sure that the combs are sterilized. There are reports of lice being passed from one hairbrush to another. 6. Ignore the pushy beach vendors. If you’re on a beach and encounter a pushy beach vendor kindly tell him no. Unless something is really unique and handmade, chances are you can buy it at any souvenir shop. Even though Nassau is filled with beautiful beaches and fun activities, guests should not let their guard down while visiting. In early 2019, a travel advisory was updated from the U.S. Department of State saying, visitors should use caution when visiting the Fish Fry at Arawak Cay in Nassau, especially at night. By guest author Michael York.